The best desktop headphone amplifiers are sometimes hard to come by, but finding the right model for you will do just the trick to elevate your music listening drastically. We’ve seen many amps for headphones come in different shapes and sizes, but lately we’ve been able to pinpoint our search down to two types — portable or desktop. Today we’d like to outline some of our favorite headphone amplifiers specifically made for your desktop, which can have a lot of positives since they can pack some more power and features into a larger body. If you’ve ventured over here from our best headphone amplifier article or merely need an amp to grab to carry around to help with enhancing your listening experience, you’ve come to the right place. In case you weren’t aware, a portable headphone amplifier is simply a miniature power amp that is particularly designed to drive tiny speakers inside of your headphones. They’re usually paired up with studio headphones but any set of cans can work with one of these headphone amps. To our convenience, there are a lot of models out there that will not only fit in your bag but pocket as well, making your listening experience more enjoyable and less of a hassle, too. 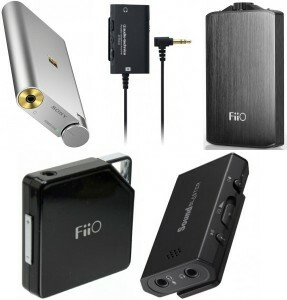 It wasn’t too hard finding the best portable headphone amps out there, and we made sure we covered some different price points, shapes and sizes to help fit the needs you may have.